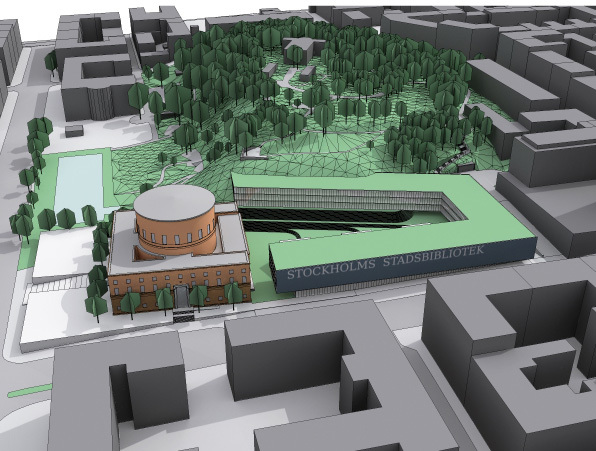 The project explores Gunnar Asplund's original idea of terracing on the northern part of Observatory Hill, it focuses the attention on today's spatial relationship between the existing Asplund library, the area where the annexes buildings are located and the park on Observatory Hill and Sveavagen. In this context the existing three annex buildings have been removed to allow the creation of an open stepped court. The footprint of the proposed building follows the boundaries along the street side in accordance to the city grid while it blends on the southern side with the topography of the hill. Here the footprint is aligned with the direction of the original link to Karlberg Castle. A green roof is provided, ideally as an extension of the green space of Observatory Hill. The horizontal articulation of the elevations of the existing Asplund library were assumed as guidelines to determine the vertical scale of the new building, according to the intention of maintaining the appropriate emphasis on the emerging cylindrical volume of the rotunda. specific relationships between the proportions of the existing Asplund library and the topographical characteristics of the site validated this criteria for the design of the extension facilities. Views from inside the library have been mostly directed towards the green spaces and the park rather than the street to suggest a sense of quietness, taking advantage of the natural peculiarities of the site. A transparent plinth hosting the main entrance and reception of the library extension is proposed at the sidewalk level on Odengatan, allowing visual perception of the open court and the activities performed inside the facility. Service access is located on Gyldengatan. Underground links are provided according to the present project's intention to avoid any alteration of the architecture of the Asplund's building. Analysis of the path of the underground concrete tunnel has suggested convenient locations for these two connections: one on north-east for the public/staff flow and another one on the south-east corner of the intervention area for the transportation of media, taking into consideration the option to maintain the existing underground functions located here, prior to a scheduled technical survey. Materials: Painted metal cladding, reinforced concrete walls and transparent glass curtain walls are the proposed treatment for the new building's exterior. Interior finishes are: translucent glass partitions and slate flooring. The main usable area of the new extension facilities is 16,500 sqm to be summed up with the existing 7,500 sqm of the Asplund library and the 1,000 sqm of the Bazaar, the project's gross area is 20,200 sqm.